DataSafe PS .Net backs up all your important data. Brutally efficient. Terribly ! DataSafe PS Net - Brutally efficient. Terribly simple. DataSafe PS .Net Data backup software backs up all your important data. Use DataSafe PS Net to back up all your data and prevent its loss due to hardware failure or user inexperience. 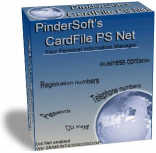 DataSafe PS .Net can backup your data to any partition of your choice or to another machine on your network. This is really a program you cannot afford being without. If you have ever lost any data due to some sort of hardware failure, or mistakenly deleted a file or folder, then you know how important it is to make backups. And that's what DataSafe PS .Net Data backup software is all about. It makes backups, backups, and more backups. So you can sleep and work easier knowing your important data is safe and sound in a secure location.